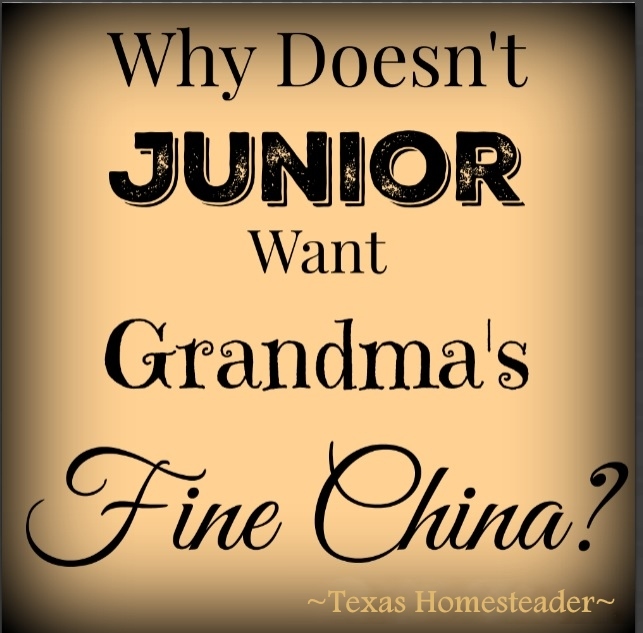 Why Doesn't Junior Want Grandma's Fine China? “I see there’s an estate sale this weekend, do you think we should attend?” I asked RancherMan recently. As I went over the high-end offerings we got into a pretty deep conversation. You see, RancherMan & I often have these deep conversations with our morning coffee. We’ve discussed kneeling at the anthem, insurance problems, political tensions, terrorism, racial tensions, generational entitlements, and more. Nothing’s been off limits. But today we were talking about the interesting social shift of current generations compared to generations passed. I wondered what future the estate sales and their higher quality antiquities would hold? Will they continue to attract buyers or would they just eventually disappear? And why are younger generations not interested in things like fine china or heavy well-made antique furniture? As we talked, a couple of things came to mind. It seems generations in the 30’s, 40’s & 50’s were vastly different than later generations. Does that explain why Junior is no longer interested in grandma’s fine china? And what does that mean for the special things a typical family might store back for their children one day? Many in earlier generations really had to claw their way through various steps in their lives. 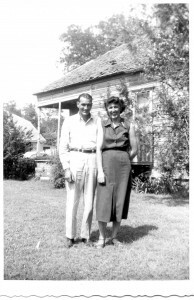 My grandparents married young in 1938 and struggled to finally get their own home, which my grandfather built. Extended family members would help get the young couple on their feet by sharing belongings they were no longer using. These things had often been previously passed down to them such as their grandma’s china and Aunt Dorothy’s dining table. Little by little they made their house into a home and started their family, while still struggling financially every step of the way. By the time their children grew up and started out on their own they had finally reached a financially-comfortable place. Now they wanted to make sure their children had the same assistance they received when they were just starting out. It was just the way it was done back then. But today’s young families have more options that are much less expensive available to them. There’s no shortage of lighter-weight & inexpensive furniture & household goods. Retailers such as Walmart & Ikea help to outfit their home on the cheap. Our grandmothers often held lavish dinner parties. And they dedicated that good china for only special occasions. Their china was often passed down in near pristine condition, cherished for its opulence from generation to generation. These generations used these gatherings as a major form of their social interaction & entertainment. Although there’s still no shortage of dinner parties today, now it’s common for groups of people to hang out more often at other entertainment venues – clubs, bars, theme parks and the like. It seems past generations were much more formal as well. Those dinner parties were often well orchestrated and they displayed all the finest possessions they had. These fineries were a great source of pride for those families. Today’s dinner parties are almost always much more casual. They often involve serve-yourself covered dish foods served on cute yet inexpensive or sometimes disposable dishes. Once older generations had their own home, often it was there that they raised their families and went through the various life stages all in the same place. It was not uncommon for many generations of the same family to live within just a few miles of each other all their lives. Today’s generation is often more mobile. They might live in several different apartments or rented houses in various cities when they first strike out on their own. And there are job transfers and moves to different states as they find their own way. Today’s generations often live in several temporary locations before finally putting down longer-term roots. What does all of this mean to me? There are always exceptions, but we shouldn’t assume that our kiddos will be excited to receive that china passed down for generations or the sturdy furniture we enjoyed as a child. It’s always a good idea to check & see if there’s any interest of course but today’s generations are in a different place than generations gone by. And for me one of the most important takeaways is that I don’t want to put back the ‘good stuff’ for use only on special occasions. We own very few higher-end items but the things we have are not tucked away behind glass or in a dusty chest, unseen and unloved. Those Waterford Crystal glasses are relished as RancherMan & I watch that golden sunset in the evenings. Grandma’s beautiful handmade quilt is on our bed right now. And I think that mentality applies to other ‘special occasion’ fineries as well – finer soaps & lotions are enjoyed now, not tucked away for special occasion. Heck we’ve decided every day is a special day, why not enjoy those things now?? This entry was posted in Blog Posts and tagged Rants on November 3, 2017 by Texas Homesteader. I have Mom’s and Grandma’s china but got rid of the set I got as wedding presents. I had to association of good times and family events with my own dishes. I got rid of my silver service and Waterford crystal at the same time for the same reason. Call me crazy, but having a link to past good times is more valuable than newer things. – Margy p.s. I’m approaching 70 so that may be tainting my view. I love love love dishes and sterling silver and cloth napkins – Linen of course – all that even though I’m a country woman (just got a load of manure from a man with horses – love that smell) . I spent a number of years teaching school in the city, small house, not a ton of company, have now moved to family home in the boondocks, a little more room , friends family and neighbors for any occasion and we all eat off treasured heirloom china. I really don’t care what family chooses to do with it when I leave the veil of tears (as my grandmother used to say) but I’m enjoying it now. Hey Tammy, I have my grandma’s glass party dishes. They’re thise ones that are a plate with a little ring for a matching cup. My mom said when she was a teenager and had parties my grandma would bring them out. I would use them when my kids were young for grilled cheese and soup. I’ve thought several times of getting rid of them, but i haven’t been able to….yet. I also have a set of Desert Rose (Fransiscan ware) that i bought because I wanted my grandma’s dishes and didn’t get them. So I bought my own when my kids were older, and those were our “everyday” dishes just as they were for my grandma. I was going to get rid of my corelle, but my oldest son said he wanted it. He still uses my corelle, but I have the matching wild flower corning ware. I love that he uses them. Try having the whole dining room set. I’m the 4th or 5th generation to have it. It actually came down the Mississippi River when my Acadian Great-great-great-grandparents came to Louisiana. When I brought it all (table, 6 chairs, and china hutch with rolled glass and lead mirrors) home both my kids said “I’m not taking that!” I tried to give it to my niece who was remodeling the old hunting lodge on the ranch but she only had room for the buffet that my sister had of the set. I guess I’ll sell it. I am not sure who might want the china, but I asked my children to let me know what they would like out of the house when we go and they said oh we can’t do that, but then I have had them come back and say I would like that chair or corner cabinet or picture and that way I can make sure it is there for them. I don’t use the good china every day, but when we have a get together I do set the fancy table. I don’t move around as well as I use to and it takes several days for me to wash dishes and set the table, but I really think it is worth it so the grandchildren can experience a fancy table setting. My grandmother use to use her cranberry cups for jello and that made it such fun to have the fancy cup for jello. She didn’t believe in saving things. Use them. Oh, one more thing. I just remembered my favorite way to use my antique dishes. I eat a salad nearly everyday for lunch, and guess which bowls I use…one of my two purple sunglass antique bowls! I just alternate between the two. It makes eating a simple salad feel like a grand event right in the middle of my day! I love to use my great-grandmother’s and both of my grandmas’ bowls, dishes, etc. for everyday occasions, because it makes me think of them several times per day. Just a few seconds of a fun memory makes the day a little more special. I don’t save heirlooms for special occasions, because, like you, I realize each day truly is special. We should absolutely enjoy every moment we’ve been given, and one way I celebrate my life is to use the fancy dishes to serve tacos or display my garden veggies in a crystal bowl. I’d like to think my grandmas would get a chuckle out of that. I agree. I took out my china we received as a wedding present 24 years ago after it sat in the cabinet for years and now we use it daily. But, also as I get older, I realize there are few things I would want of my mommas just because it is hers. and it will make me think of her. It is funny how what is important to us changes over the years. The beautiful old china is not dishwasher safe. My almost daughter in law does not use a dishwasher and wants my old china when she sets up house. I’ll be glad to give it to her as I do use the dishwasher. She can use and enjoy it as every day china. I have a quilt my grandmother made from scraps. It is old and tattered. I used it when the kids were sick and they loved it’s soft feel. It is put away safely. I guess someone else will have to pitch it. I enjoyed your article today. Thank you.